As the tradition goes “The Eve of the Fly Fair” marks the start of this bi-annual gathering of international flyfishing enthusiasts, which is held in The Netherlands. During this event several prizes were awarded to those who promote the outdoor leisure is all its aspects. 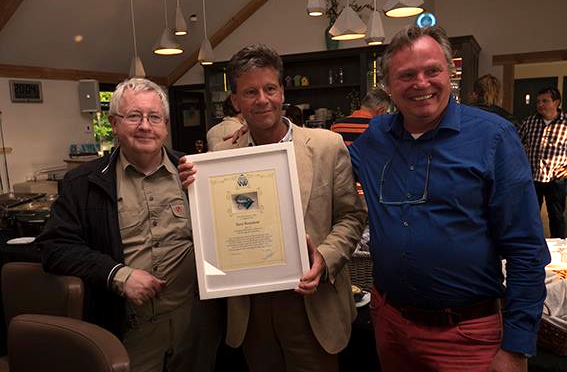 Here René Beaumont received the “Gerd Janssen-Fly” from John Hagens, president of the Dutch Federation of Flyfishermen (VNV), for his work to conserve indigenous trout, and involving the flyfishing community in it. Franklin Moquette (former president of the VNV, left on the picture), has supported CTCF’s initiative right from the very start.